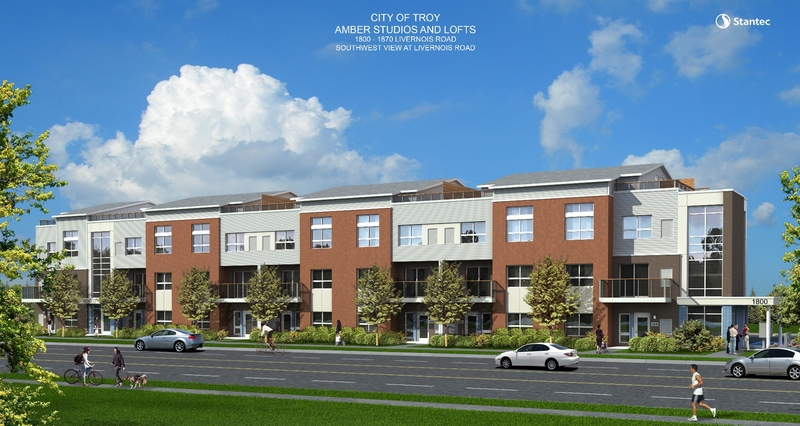 Amber Studios and Lofts -- a 3-story brick, metal, and glass building at the east side of Livernois Rd. 2 blocks north of Maple Rd., Troy. Urban-style Studios and Studio Lofts include hot and cold water, electric cooktop, convection oven/microwave, refrigerator, dishwasher, air conditioner, ceramic tiled bath and kitchen, polished concrete or hardwood floors, and paved parking; but exclude electricity, gas, and telephone. Laundry machines, vertical blinds, and USB charging ports are provided in each unit. Cable T.V. available. 7 - Private entry 0 bedroom Studio with full bath, patio and polished concrete floors. Approximately 425 sf in area. 12 - 0 bedroom 2nd floor Studio with hallway entry, full bath, balcony and hardwood floors. Approximately 355 sf in area. 2 - 0 bedroom 2nd floor Studio with hallway entry, full bath, balcony and hardwood floors. Approximately 390 sf in area. 10 - 0 bedroom 3rd floor Studio Loft with hallway entry, full bath, roof-top terrace and hardwood floors. Approximately 486 sf in area. 2 - 0 bedroom 3rd floor Studio Loft with hallway entry, full bath, roof-top terrace and hardwood floors. Approximately 442 sf in area. 2 - 0 bedroom 3rd floor Studio Loft with hallway entry, full bath, roof-top terrace and hardwood floors. Approximately 470 sf in area. 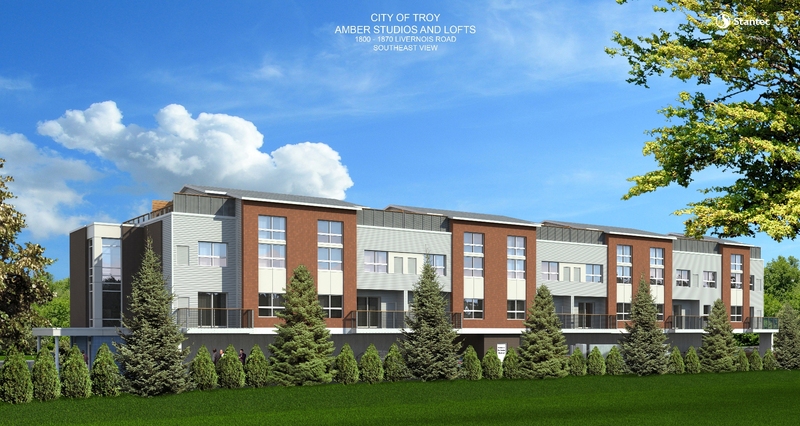 Amber Studios and Lofts are within walking distance of shopping and entertainment, near Somerset Collection, Troy Community Center, Library, City Hall and Big Beaver Rd. Also close to I-75, Woodward Ave., downtown Claswon, and Royal Oak.